Using a stand mixer fitted with a paddle attachment, cream together the butter and brown sugar. Add the egg and water and beat for 30 seconds on medium speed. Add cake mix and beat on medium until full incorporated. Batter will be thick. Spray a 9x13 pan with baking spray. Pat the mixture into the pan using your hands to make it even. Bake for 30 minutes at 350°F. Place Peppermint Bark Muddy Buddies™ into a plastic bag and beat with a rolling pin or spoon to crush up the mix. Sprinkle crushed Peppermint Bark Muddy Buddies™ on top of the frosted bars. Holidays and Chex Mix go hand in hand. Pretty much any holiday gathering I've attended has some form of Chex Mix. For years, there was just the standard go-to savory Chex Mix, but then things got sweet and creative. The invention of the Muddy Buddy came along and changed everything. This holiday, it just changed again with Peppermint Bark Muddy Buddies. Which I pay tribute to in a Peppermint Bark Muddy Buddy Bar. 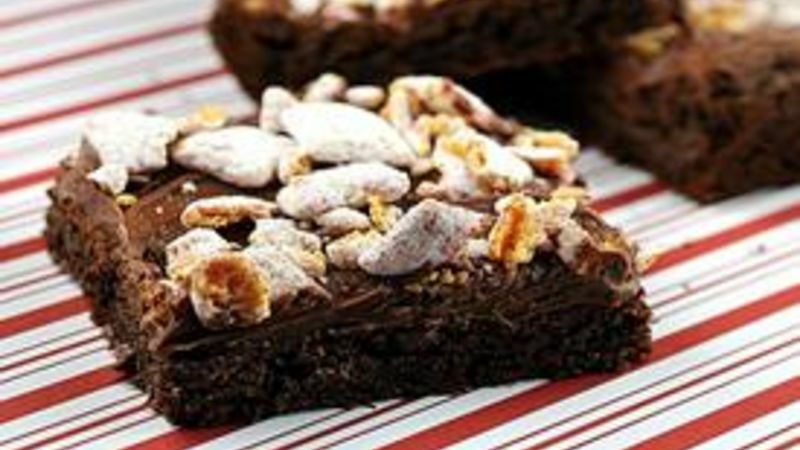 Now you might be tempted to just eat Peppermint Bark Muddy Buddies Chex plain and that is fully acceptable, but as a bar they are easy, festive, and yummy – so why not give it a go? If you use Betty Crocker cake mix and frosting, you will have these whipped up in no time. Using a stand mixer fitted with a paddle attachment, cream together the butter and brown sugar. Add the egg and water and beat for 30 seconds on medium speed. Spray a 9x13 pan with baking spray. Pat the mixture into the pan using your hands to make it even. Bake for 30 minutes at 350F. Place Peppermint Bark Muddy Buddies into a plastic bag and beat with a rolling pin or spoon to crush up the mix. Frost. Then sprinkle crushed Peppermint Bark Muddy Buddies on top of the frosted bars. So break away from just having Chex Mix in a bowl and try them on a bar this holiday season.